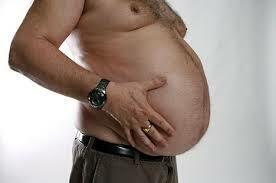 Okay.. at some level, we all know that belly fat is not a good thing to have and hold on to. But do we really know why carrying the spare tire is really a hazard to your health? Well recent research indicates that belly fat is the so called ” smoking gun” that links visceral fat ( the type of fat that is deposited in your gut and around all your vital organs) to heart disease, cancer and host of nasty degenerative diseases. And the number one culprit that is responsible for belly fat is… excess Insulin. Insulin is the storage hormone created and released from your pancreas in response to food being digested and assimilated into the body. Once your carbohydrates , fats, and proteins are broken down into the smallest of molecules ( glycogen, fatty acids and amino acids ) these nutrients are absorbed into the body from the small intestine through the portal vein. Now.. depending on how much food you eat at one sitting or the amount of carbohydrates you are ingesting at any given meal, your pancreas will secrete the hormone insulin to transport those micro food particles to the liver and store them as an energy or assimilate them into the building blocks of your metabolism. Excess food and or carbohydrates that are not stored in your liver or muscle cells for energy will be converted to fat and stored in the fat cells around your tummy. Clear so far? Okay so now the plot thickens. What was once thought to be inert body fat hanging around your waist not bothering nobody has now been proven to be micro mediators of inflammation. Excess inflammation created in your fat cells can circulate to other parts of the body and create havoc to all of your tissues and organs. Inflammation can cause the destabilization of plaque in your arteries which can lead to heart attacks, strokes, and various forms of dementia. Excess inflammation created by your fat cells has also been linked to various types of cancer. Not really good news right? So what can we do to alleviate the spare tire. More importantly, what can we do to alleviate the risks associated with inflammation? Well.. the number one action step to get rid of the spare tire and the excess inflammation is to lower the glycemic load of your meals. That’s a fancy term for cutting back on the amount of starchy carbohydrates you eat at any given meal. Now I am not saying you have to eliminate starches completely. Can you imagine a world without potato’s, pasta, or bread? I certainly can’t. What I am saying is you have to think about balancing your meals. Here is a quick rule of thumb: If you are going to have some starch at a meal, make sure it is in equal proportion to your protein portion. Think of protein and starches in a one to one ratio. Your protein should be equal to the size and thickness of your palm. This method was first described by Dr. Barry Sears ( The Zone Diet ). He called it the Hand Eye Method. Of course this is going to leave allot of room on your plate. The rest of your plate can be filled with fibrous carbohydrates ( vegetables ) and low glycemic fruit. Oh by the way, make sure your protein source is low fat. Best choices are chicken, fish, lean cuts of beef, egg whites and Tofu. Now the last part of the equation: Adding a pinch of fat to the meal. Monounsaturated fats are best here. Olive oil for dressing and cooking. Avocado and sliced almonds work wonderfully on your favorite salad creation. So there you have it. Lower your insulin levels by lowering the glycemic load of your meals and you will have gone a long way to not only look better but actually improve your well being. Two benefits for the price of one. From here, I got to know that having a right kind of diet which suits your body is the first step which one needs to take for making him or her look healthy and fit. Best Affordable Personal Trainer are the best way outs from who can tell you about the correct exercises and diet food as according to your body type.